Candy Chaser is a new release that joins the current trend of finding previously unknown games from the Far East and bringing them to the English gaming public. 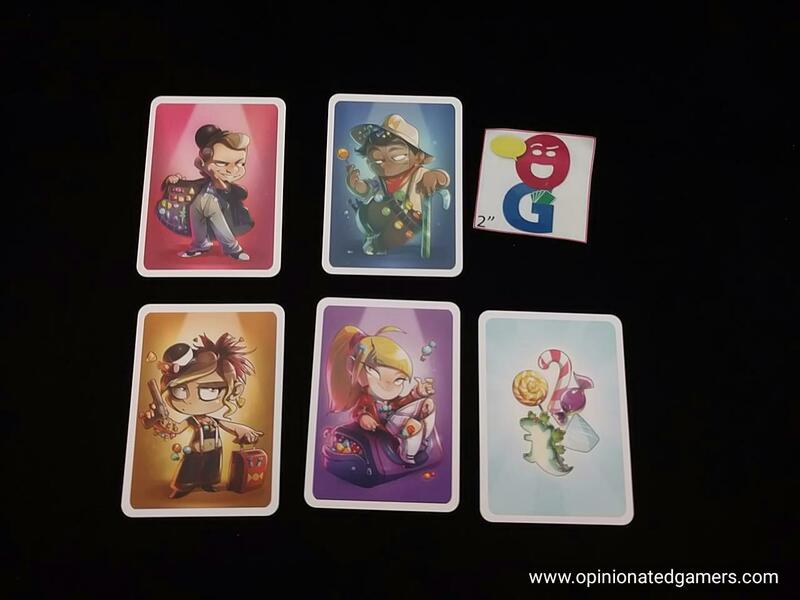 Candy Chaser is a game that was originally produced in 2013 by Grounding, and thus some of my Japanese friends were aware of it – I did not know anything about it until I met with the head of IELLO at Essen 2015. 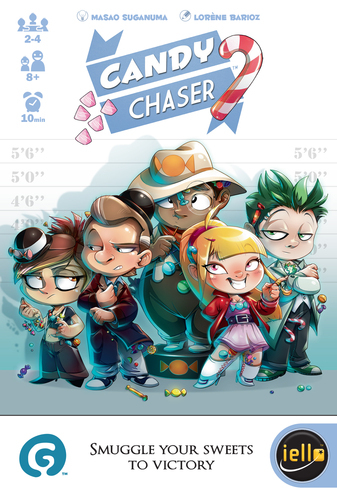 Candy Chaser is a nice bluffing mini-game where players take on the role of dastardly and cut-throat candy smugglers. Each player is responsible for the supply of a particular type of candy, and the goal is to try to be the player whose candy sells for the most in the seedy candy black market of your little town. 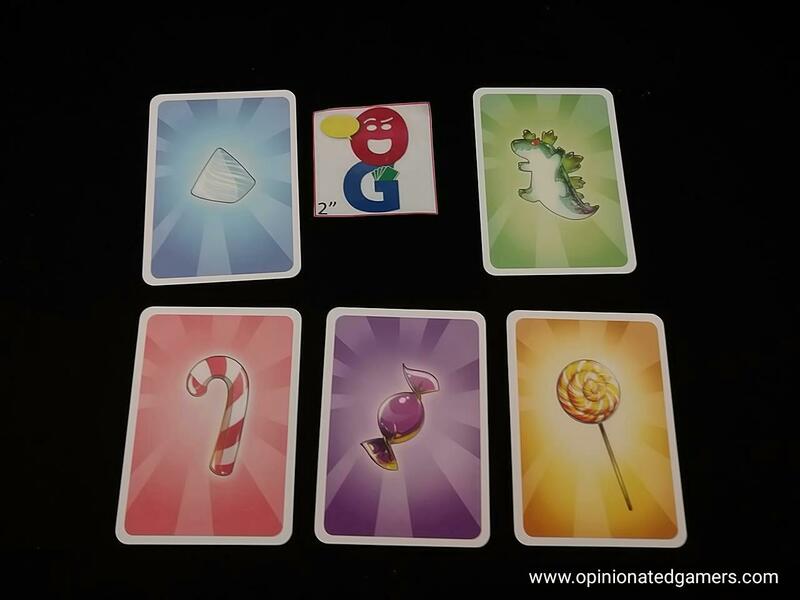 At the start of the game, each player is dealt a card which tells them what form of candy they are trying to push. They also get a set of 5 Tattletale cards: one for each of the five varieties of candy that are illicitly sold in the market. The market price board is set in the center of the table, and each candy starts at a base price of zero. The game is played in two phases – a Marketing Phase and a Tattletale Phase. In the Marketing Phase, the active player rolls the price die which could roll: -2, -1, +1, +2, +2, +3. You then change the price of ANY one of the five candies on the market by the number of the die roll. If you are unable to use the entire roll, you must move the price cube all the way to the end of the price line and any additional movement is lost. The roll cannot be split up amongst different price cubes. Of note, the prices on the board go from -2 to +5. There is one more column to the right of the +5, and though it looks like a six, it is actually a “G” for Goal. You may not move a cube into the G column until there are at least two cubes that are in the darkened +3 to +5 range on the board. Thus, if there is only one cube in the +3 to +5 range, and it is moved positively, it must stop at the +5 column. 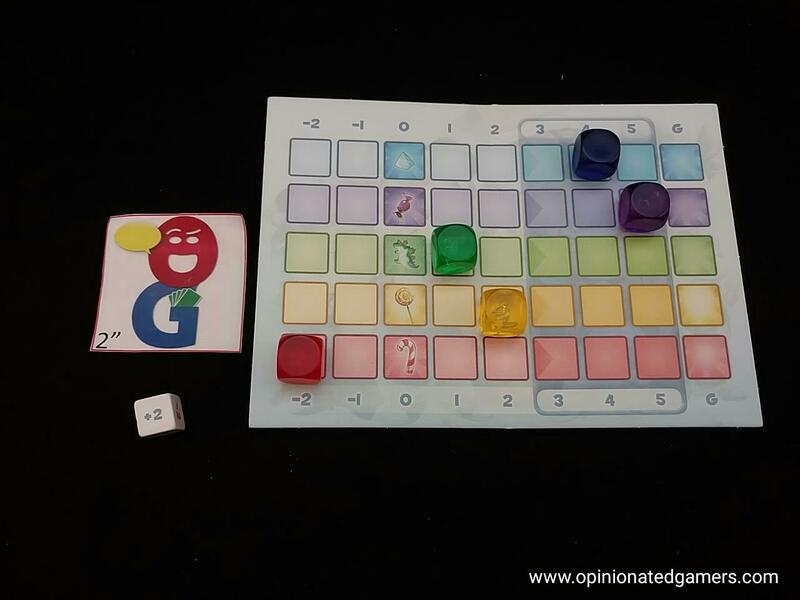 However, once a cube is placed in the G column, the Marketing Phase ends and the game moves into the Tattletale phase. The player who moved a cube into the G column is the last player to go in this phase. So, starting with the player to the left, players can choose to tattle or not. When you tattle, you slide a Tattletale card face-down to a player – and you are trying to match their objective card… That is, you are trying to correctly guess which candy type they are selling. Note that in this phase, you NEVER reveal what your Tattletale guess is. The only players that know what you guess are yourself and the targeted player. The targeted player announces the results of your guess. If you are wrong, you are eliminated from the game. However, if you are correct, the targeted player is eliminated from the game. Furthermore, you could choose to tattle on another opponent or simply end your turn. Note that you are never obligated to tattle. If you are unsure, you can simply pass your turn. Whenever your turn is over, the next player who is still in the game gets a chance to tattle. This continues until all players still alive have a chance to tattle. This phase only lasts once around the board. Now, it’s time to see who wins. If there is only one player left standing – that player is the winner. Otherwise, the player who has the highest valued candy is the winner. Ties are broken from top to bottom on the price board. Though it doesn’t seem like there is a lot to the game – this cute little bluffer has proven to be a lot of fun. It’s very hard to succeed by taking the obvious strategy – that is always pushing your own cube positively – because you’ll surely be knocked out in the Tattletale Phase. Instead, you have to be crafty with how you move cubes around the price board so that you don’t give away your candy’s identity. Of course, if you’re too crafty and disguise your motives too much, you’ll find that your candy is not very valuable at the end of the Marketing phase. If this happens, the only way that you’ll win the game is to eliminate everyone else ahead of you on the board, and that’s not the easiest thing to do. I usually try to keep an eye on people’s reactions as I move different cubes on the board – or watch their reactions as they choose. Sometimes this works, but other times, it’s hard to get a feel for what candy belongs to which person. In the Tattletale phase, you are not obligated to tattle, but if you don’t – that certainly makes you look suspicious for being the guy with the best candy. Of course, maybe that’s just what you want people to think so that they will tattle on you with that choice, and then when they are wrong, they’ll be eliminated… As the guesses are never revealed, it is possible for multiple players to accuse you of the same candy, and they can all eliminate themselves. At the other end of the spectrum, if you have the lowest valued candy, you can only win by eliminating everyone else – so you have no choice but to tattle away. The artwork is still Japanese in feel with characters with large eyes and overdone facial expressions – but it’s certainly not the cute kawaii look. There is definitely a seedy feel to the art, befitting the theme of smuggling for sure. The line of IELLO Mini-games is turning out to be a crowd pleaser around here. The line comes in small boxes: 6” x 4” x 1.5”. Other titles include: Welcome to the Dungeon, Kabuki, Seventh Hero, Tem-Purr-A and Schotten Totten. So, as you can see, most of these mini games originated in the Far East, but not all of them! They are portable, easy to teach, quick to play, and I find that they are nice to stash in the car for road trips and soccer games. I have been known to remove the inserts from the boxes which then allows me to store three games worth of material in a single box – and that becomes a super space efficient way of packing fun into a trip. This is not my favorite in the bunch (Welcome to the Dungeon and Seventh Hero) – but it’s still fun and is a worthwhile diversion. Dan Blum (1 play): I played the original version and really didn’t see a lot of point in it. It is likely that players will have few enough turns that accusations will be a crapshoot unless people are being very obvious with their moves, which is easy to avoid. It avoids a “not for me” rating only because it’s so short. Joe Huber (1 play): I also played the original version of the game. And Dan sums it up well – it’s not a bad game, but I’m mostly willing to play it again because it’s over quickly. Neutral. Dale Y, Dan Blum, Joe H.
I only played this once, at Origins a few days ago. While not at all a deep game, I’d add that it works surprisingly well even in a 2-player format. You almost jump directly to that last round of Liar’s Dice where 2 players have 1 die each, and you have to figure out whether or not the other player is bluffing.